Dispelling the myths about sharks. You can feel it in your soul before you ever step off the boat and sink below the surface. You are entering the world of creatures who have been portrayed as “mindless killers” and “vicious predators,” and yet you are excited about facing them and finding out for yourself if the myths are true. It’s that excitement and curiosity about the unknown that pushes us to explore. Sharks are an important part of the food chain and keep the ecosystem balanced. We’ve all seen the stories on Shark Week and read the “news” reports on the Internet of the horrible shark “attacks” that happen, so we are conditioned to fear sharks. I understand that fear completely, but want to try and bring the reality to the forefront and help change that mindset. As a child I grew up in the “Jaws” era, which made me phobically afraid of sharks, believing they waited beneath the surface to “eat” us the minute we entered their world. I was so horribly afraid that I wouldn’t even put my feet in the sea nor get on a boat in the ocean for fear of it sinking, and inevitably being eaten alive by the “vicious predators” lurking in the dark. It took one snorkeling trip to the Turks & Caicos Islands to change my entire life—literally. I was empowered by the tranquility and peace I felt in the water to try diving. When I encountered my first shark I was terrified, but that terror changed in a split second when the shark just glided by without “attacking” me. My focus was drawn to the way they moved through the water with elegance and grace and how beautiful they were—nothing like the monsters I had grown up fearing. This encounter led me to become a scuba instructor. The driving force behind that decision was that I wanted to show people the truth about these sharks and change their fear to love, respect and a desire to protect them. I began studying sharks, reading anything I could find, and educated myself on their habits and behaviors. This transitioned me from being deathly afraid to craving close encounters with them. Our oceans and reefs need sharks to keep the eco-system balanced. The only way to protect sharks is to help people understand them, and the best way to do that is to get “up close and personal” in their natural environment. I had followed SDM Adventures (Shark Diver Magazine) for years on social media. I was constantly in awe of their ability to safely share close-up space with massive tiger sharks, hammerheads and bull sharks—all of which are touted as top apex predators. I became very familiar with three of the regular sharks that appeared on these shark dives and was intrigued with the relationships Eli Martinez, owner of SDM Adventures, had seemed to build with these big girls. Emma and Hook (both tiger sharks) and Patches, the great hammerhead, are celebrities in their own right and have become ambassadors for protecting their species. A little history on SDM Adventures and Eli Martinez may shed some light on how exposure to animals we fear leads to curiosity and learning, which then leads to understanding and the desire to protect them. Eli grew up in Texas surrounded by wildlife, always playing with toads and lizards. He consumed as many books about animals as he could find, which fed his passion to learn more. As a child he wanted to grow up and become a wildlife vet in Africa. His desire to help animals burns even deeper as an adult. On his first ocean dive he saw a shark. This both frightened and excited him because he thought it was going to attack him, and when it didn’t, it opened up Eli’s mind and pushed him to learn more about them. His love affair with sharks began. There seemed to be a magazine dedicated to every other recreation and sport out there, but there was nothing about diving with sharks, so in 2002 the concept for Shark Diver Magazine (SDM) was born and in March 2003 the first issue was published. This image depicts the grace and beauty of sharks in their natural environment. The goal of Eli and SDM Adventures is to destroy the “predator” myths about sharks and bring awareness to their necessary role in the eco-system and the importance of protecting them. In his own words, he is the “voice of the voiceless” for these beautiful and intelligent animals. Hundreds, if not thousands, of people have changed their perceptions of sharks after having the opportunity to dive and interact with these amazing predators, as well as attending speaking engagements by Eli and his team about the sharks at Tiger Beach. Their fears transitioned to interest and curiosity, and their hearts now beat with passion instead of fear—all of which leads to more ambassadors for shark conservation. Eli is the center of SDM Adventures, but is supported by his entire family. His wife Maritza handles bookings and helps prepare for the trips, sometimes joining Eli. His son is in training to take over SDM someday, as well as being a professional bull shark feeder in Mexico. His daughter is also training to run SDM, besides being an accomplished wildlife photographer who may just go on to be a National Geographic photographer and storyteller. I have done a couple thousand dives with Caribbean reef sharks and nurse sharks, but I craved an encounter with a big tiger shark. I wanted to come face-to-face with these mysterious creatures and feel their power for myself. I knew it would be one of the most amazing encounters of my life. Last year I finally booked a trip to dive with the big girls of Tiger Beach and for me there was no other choice than SDM Adventures to show me this world. From the moment Eli stepped foot on the boat, I was aware that I was in the presence of a shark legend who has shown the world that apex predators and humans can not only safely co-exist, but who has also showcased how intelligent these creatures are and the importance of their survival. As I geared up on the dive deck, I was taken by complete surprise that my heart raced with anticipation and excitement that after 40 years of misguided fear, I was about to come face-to-face with the monsters of my nightmares. As I stepped off into the turquoise sea and descended, I could not wait for the first tiger to appear, and in complete contradiction to what media and movies portray, not a single tiger shark appeared to devour me. Towards the end of that first dive, a dark and very distinctive shadow appeared in the distance. I only had a glimpse of her beauty on this dive, but I could feel her presence and power. 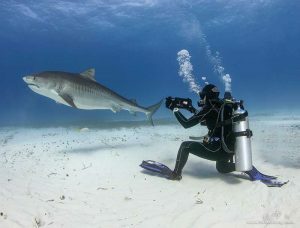 The author prepares to “shoot” a tiger shark with her camera. The second dive and every dive thereafter on that trip, was the experience I craved. With up to nine tigers ranging from nine to fourteen feet in length, a great hammerhead, and as many as fifty lemons and Caribbean reef sharks, it was truly shark utopia. Having the pleasure of finally experiencing the intimate encounters with Hook, Emma and Patches after all these years was more than just magical, it was humbling. When I saw Hook for the first time (who had been missing for the past two years and feared dead), my eyes filled with tears of joy to know she had come home and was safe! When a MASSIVE shadow came towards me from the shadows of the distance, I knew instantly that it was Emma, who is the largest and believed to be the oldest girl at Tiger Beach. When Patches the great hammerhead showed up, all the stars aligned. There are no words that could truly describe those moments, but I fell in love with these girls and knew I was on a bigger path to protect them. Their world is not one for complacency or arrogance, but one that showcases their power, intelligence and position on the food chain. We are definitely visitors and should behave as such. I was a huge advocate for protecting sharks already, but after being in the water with tigers it made me very aware of the need to educate more people on how we can safely interact and coexist with these creatures instead of killing them—either out of fear, greed or baseless traditions. A couple of years ago, there was a report of two tiger sharks found feeding on a dead whale carcass in shallow water in the Bahamas. The powers-that-be decided swimmers were in danger so they killed approximately 20 tiger sharks—we thought Hook had been part of that cull. Humans destroyed at least 20 innocent creatures for doing exactly what they are designed to do in THEIR environment—arrogance and greed at its worst. There are over 440 different species of sharks—each designed for a specific niche role in the environment. For example, tiger sharks are designed to crush turtle shells and therefore help control the turtle population. Hammerheads control stingray populations and great whites control seal and sea lion populations. Sharks maintain the species below them in the food chain, removing the weak and sick, and serve as indicators for the health of oceans and reefs. 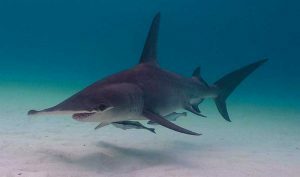 As a dive professional in the Turks & Caicos Islands, I encountered people every day whose reactions were “fear” when the topic of sharks came up. After half an hour of talking with them about the beauty and necessity of sharks, their demeanor starts to shift to interest and then fascination. 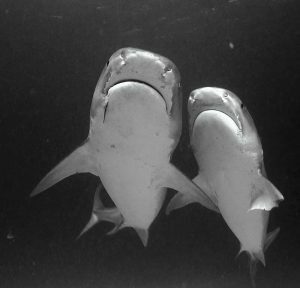 Once they see their first shark on a dive that fascination grows into love. Diving in the Turks & Caicos will no doubt expose you to Caribbean reef sharks, nurse sharks and the occasional lemon shark, but rarely will you see a tiger shark on a dive as they tend to stay in shadows and are very cautious. We are fighting for a time when commercial fishing for sharks will come to an end and ALL gill nets will be banned forever. I am honored to be a soldier in this battle and collaborate with brilliant and compassionate minds to bring awareness to this necessary topic. If we can introduce people to sharks, of any kind, and have them see for themselves that we don’t need to fear or destroy them in order to co-exist with them, we will forge a strong defense in protecting sharks from imminent extinction. If I could add anything to this from a personal standpoint, I would say please don’t fear what you do not understand; instead educate yourself and become an ambassador for the innocent creatures who need our help for their survival, and ultimately our own. Come dive with sharks and feel their majesty; it will empower you to join the fight! For more information on Tiger Shark Diving aboard the M/V Dolphin Dream, contact SDM Adventures at (956) 279-8119 or visit www.sdmdiving.com.